I swear this Rustic polymer clay beads technique has really grabbed hold of me and driven me to some serious time in the studio. I seem to be addicted to making Rustic beads, connectors, headpins, and all manner of other jewelry findings. Just one more…and another. Not that I’m complaining, mind you. They’re so quick and honestly so satisfying to make. They’re a lot of design bang for a little bit of effort. So…introducing…the Rustic Beads and Components Tutorial is now available! 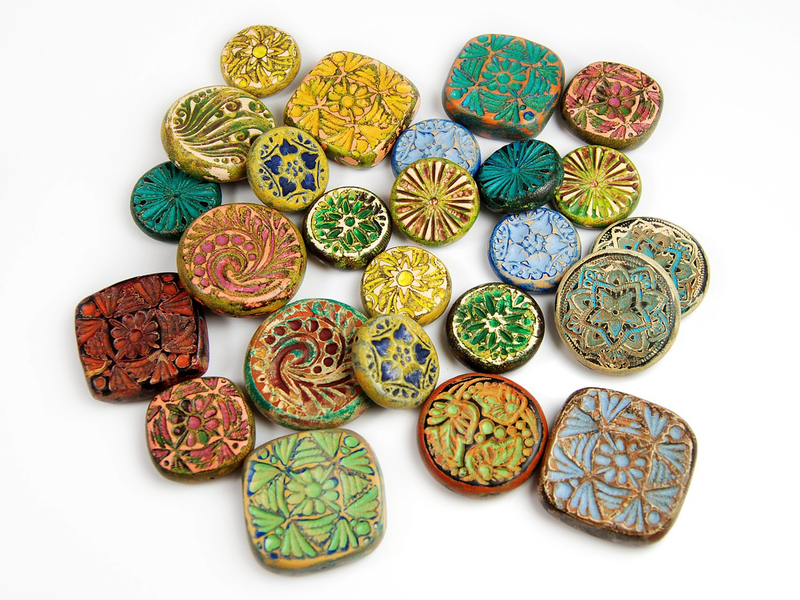 So what are Rustic Polymer Clay Beads and Components? You might have seen me posting Rustic Beads here on my website, on Facebook, or on Etsy. And I used them in my recent entries for the Bead Soup Blog Party. The basic idea is that you create a textured bead or component from polymer clay and then paint, distress, treat, and otherwise abuse it until it looks just right. Depending on the textures and colors you choose, you can have everything from a dark grungy volcanic feel to a light romantic antiqued feel. It’s a very versatile technique. I’ve even had fun with some tribal motifs. In this polymer clay tutorial I show you step by step how to create this rustic look, what materials to use, what to look out for, and how to avoid common mistakes. I’ve made the mistakes myself and spent time solving them, so that you don’t have to! You can hit the ground running and have fantastic distressed beads and components in no time at all! What if you’re a jewelry artist or beader who has never worked with polymer clay before? This tutorial is completely appropriate for a beginner. If you can mix clay in your hands and cure it in the oven, you’ve got enough experience to have great success with this technique. When I started making jewelry I never had any trouble coming up with beads (I do work with polymer clay after all) but it was the components that bothered me. It’s so frustrating to create themed beads and then have to put your jewelry together with craft store components that don’t really match. Now you can make headpins, connectors, and charms that match your focal beads. I show you some tricks to make them durable and strong. So why rustic, crusty, grungy, and antiqued? I’m sure you’ve noticed the recent design trends toward rustic, distressed and tribal or ethnic assemblage jewelry. Have you seen the work by beatnheart, Love Root, Fanciful Devices, Anvil Artifacts, and Pip n Molly? And not to mention the lovely natural themed polymer clay designs of Dandy Beads and Humblebeads Jewelry? 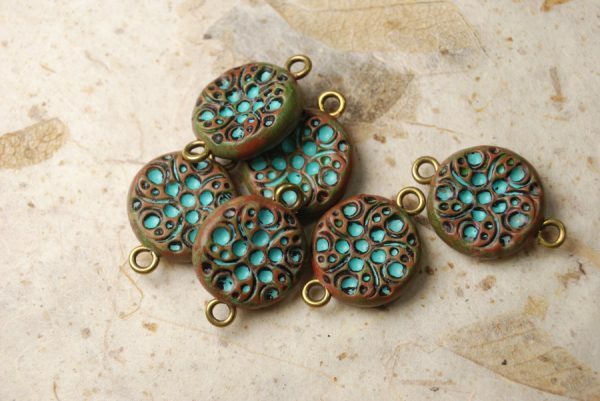 If you’re intrigued by this new trend and want to move your polymer clay skills into a new area, then my Rustic Beads and Components Tutorial is a step in that direction. Enough of looking at beads and connectors and headpins and charms? Do you want to see some jewelry made with these Rustic Components? Here you go! Or do you just want to go buy the tutorial? This is awesome, I love your components, they look amazing! I don’t have a kiln though…is it required? Nope. You can bake polymer clay in your home oven at around 130°C. Easy peasy! Wooooooooooow I’m so going to buy this!!!!! you look just like Diane Lane. Your so beautiful!!! LOL, okay, I wasn’t expecting that. Thank you! I will say, however, that I have a really great photographer. And it took over 75 shots and a lot of swear words to get that picture. It’s all in the lighting, I assure you!! oooohhhh. Been waiting for this. I am a big, big ,fan of your rustic beads and just love the many versatile looks you can get with these beads! Thank You so much for sharing ! Delightful ! I love your blog ! Why thank you Debra! What a great thing to say. You’ve put a big smile on my face! I love how it still has ” your look ” and the great deep pops of color. I’m always amazed at how much our own personality and voice comes through our art. I think it’s like handwriting, we each have our own and even when we’re following someone else’s directions it still ends up looking like us. And I also love the color…polymer is a major drug for a color junkie like me.